Left: Passengers preparing to board Houston’s Metro light rail. 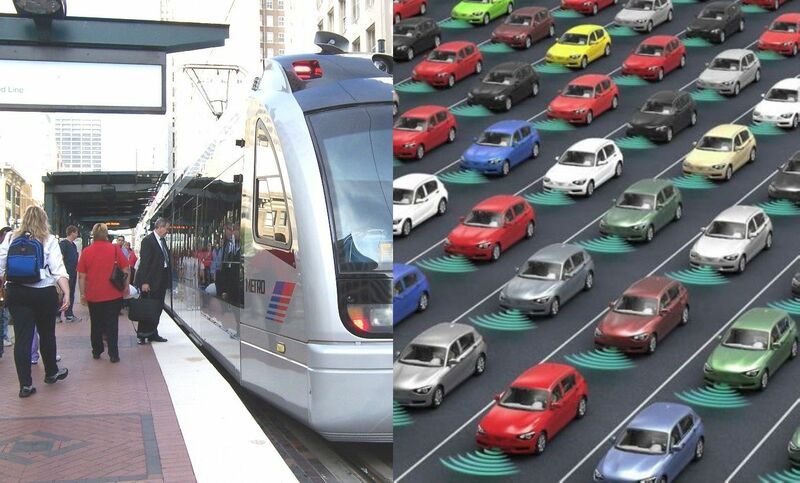 Have “Smart City” visions scuttled Austin’s hopes for urban rail? Right: Simulation of “Smart City” traffic with autonomous and “connected” vehicles. Sources: L. Henry; Propmodo.com. Roger Baker is a longtime Austin transportation, energy, and urban issues researcher and community activist. The following commentary has been adapted and slightly edited from his comments recently posted by E-mail to multiple recipients. References for numbered citations are at end of post. This big shift away from business as usual obviously required a new plan with a lot of detail. The City Manager was ordered to draft a New Mobility EV/AV Plan by June 15, 2017. One part of this policy shift was to get people within the Austin Transportation Department (ATD) to help promote this shift. Two of the top ATD people responsible for this are now Karla Taylor, in charge of all ATD staff, and Jason JonMichael who knows about wiring “Smart Cities”, stuff like getting all the vehicles and street intersections and other vehicles to talk to one another, and persuading the public to accept the shift. This new industrial development policy reportedly is meant to help generate startups and assist in the new programs developed by mobility tech leaders like Google, Tesla, Uber. And even Ford, which wants to move in the same electric and alternative transportation direction. The new wave of sharable scooters and bikes fits right into this new city perspective. It is true that light rail transit (LRT) is electric, but currently it is only rarely autonomous. Since high-level corridor LRT service handles so many people with one driver, there is not such a great need for rail to operate autonomously. On the other hand, autonomous vehicles like Uber cars, trucks, and buses would be a different story since the big mobility providers could maybe save money two ways. They can save on transportation fuel cost by shifting to electric, and supposedly also by possibly eliminating driver labor. 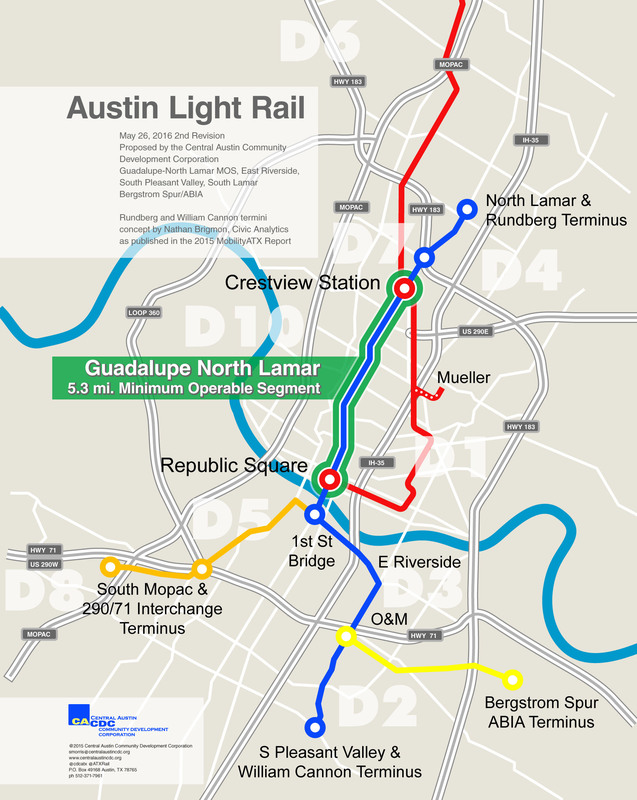 In order to get everyone moving in the same direction, and shift to the new transportation agenda, Capital Metro had to be brought on board. Aside from its penny sales tax, Cap Metro can’t issue bonds using city resident’s property, but the city can do so. Without much state funding and with federal funds uncertain, a lot of the cost is probably now going to fall on local taxpayers. This shift was also made by hiring a new transit czar, Randy Clarke, who understands that his new marching orders include things like new autonomous and electric buses. Of course this also meant making a big shift in the nearly complete Project Connect planning process, which was supposed to be finished in September 2018 after years of work. But in mid-2018 the Project Connect process, now falling under autonomous-friendly management, was extended to December 2018 for an additional $600,000. As a result, we should see a new rapidly revised version of the Project Connect plan soon, with more than just lines on map. 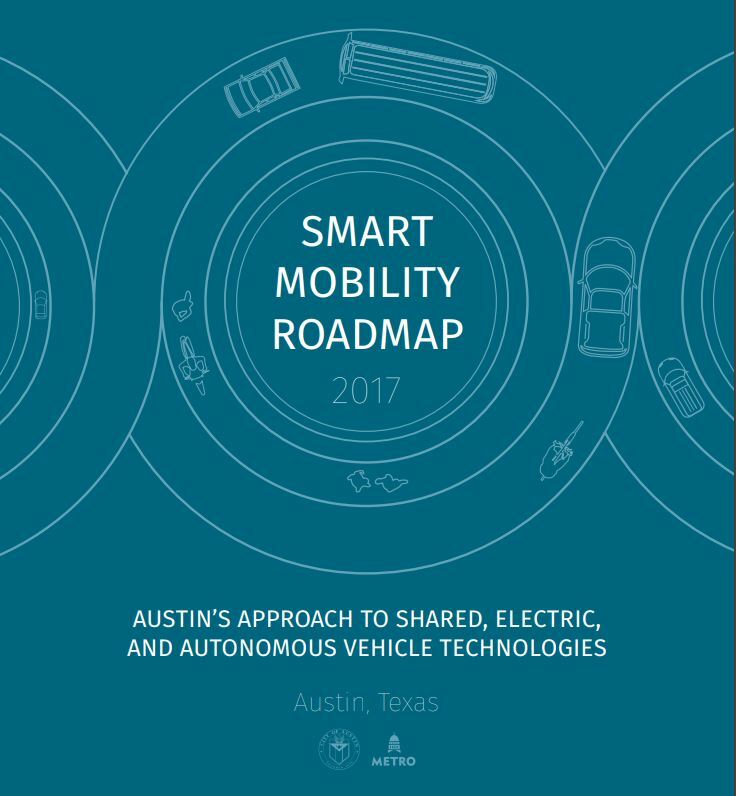 City of Austin’s Smart Mobility Roadmap. We all know, or should know by living in our high-tech city, that all kinds of automated and electric vehicles are destined for our future. Scooters, autonomous vehicles, rental “Smart Cars”, and incredible stuff like fleets of autonomous connected buses will be shuffling throughout Austin, supposedly solving our congestion problems as they go. It’s not hard to foresee these “pods” adding to the mix of new modes gushing onto the streets and sidewalks of Austin. By adopting the Smart Mobility roadmap as official city policy, Austin has made it pretty clear that whatever the tech giants like Lime want to do will get a friendly reception here. The strategy here is apparently to make Austin a kind of Petri dish – in effect, a laboratory experiment – to incubate and give birth to all kinds of innovative high technology startups, such as the recent invasion of rentable electric scooters (which incidentally are not permitted in Seattle due to safety considerations). 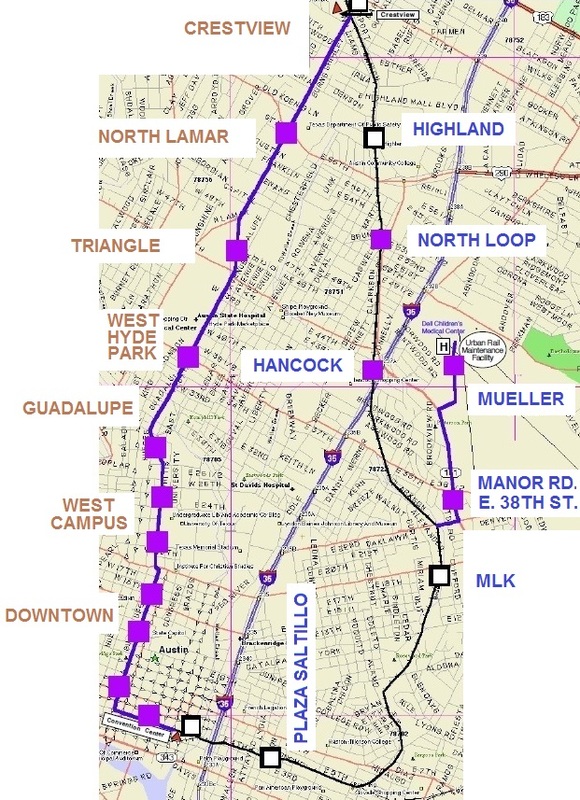 Also included here is Cap Metro’s vision of autonomous, electrified bus rapid transit (so far, not operating anywhere as far as anyone knows). From this permissive support for high-tech innovation, the benefits are supposedly going to trickle down to average Austin residents, who will end up paying an unknown share of the final cost. 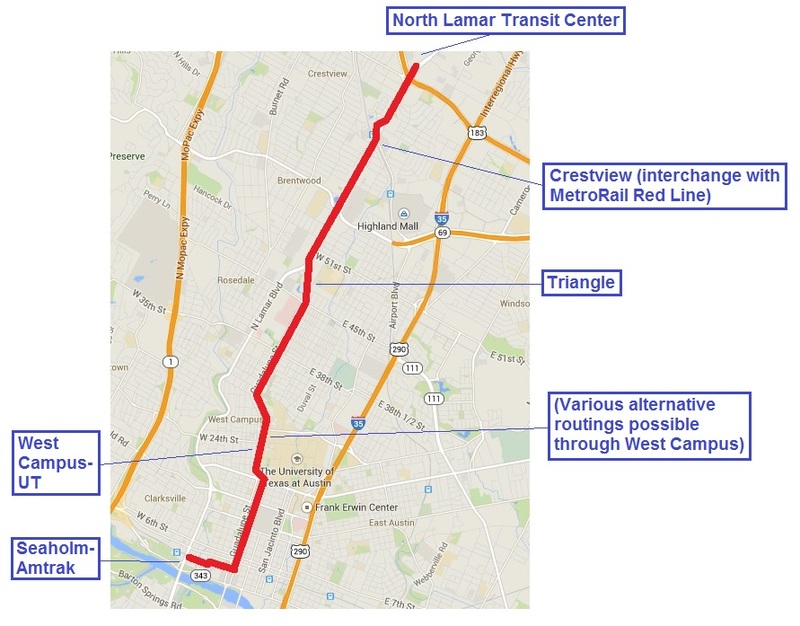 But how can Austin continue to manage to deny the need for a very high-capacity corridor transit system (only rail has the adequate capacity) running roughly between our highly congested road corridors of I-35 and MoPac? Even now, nearly twenty years after such a reasonable system was narrowly defeated, we still try to ignore the obvious under city-level political pressure, as usual based on using average homeowner-based property tax revenue to benefit private real estate development interests. This defies all logic, and to me is yet more evidence of the continuing special interest influence over Austin’s transportation planning. At some point we need to bite the bullet and admit that public funding is limited and requires hard choices, not only involving mode choice but also geographical areas. CAMPO’s outlook is that we can have both “guns and butter”, that unlimited roads plus lots of transit are somehow affordable. The fact that neither the state nor federal gas taxes have been raised for 25 years is clear proof of our continuing denial of economic reality and our inability to make hard choices until something breaks. 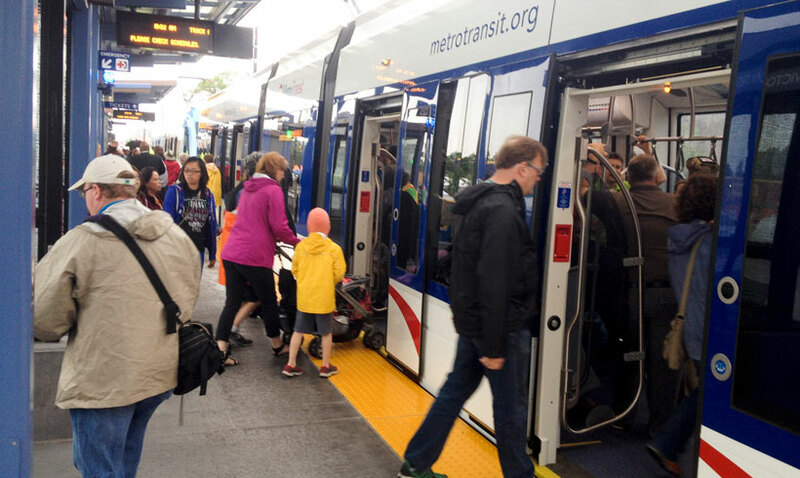 Attractive high-capacity light rail transit is changing mobility patterns, boosting economic development in cities like Minneapolis-St. Paul. Photo via Transit for Livable Communities.